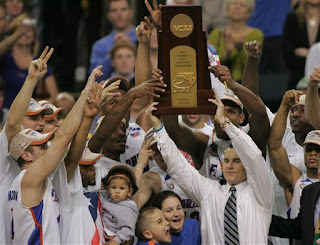 The Gators hoist the National Championship trophy. Thankfully, Noah's ugly mug is well-hidden. It's as simple as that. In the 2007 NCAA Men's Basketball Championship tonight in Atlanta, the Gators bullied the Buckeyes, and they did it with style. This is actually the first bracket I've ever filled out in which I've picked the right two teams in the championship game and the right champion. I figured, going into the tournament, that as long as the Gators had gotten over their late-season slump, they'd be unstoppable in the tournament. They certainly made me doubt them at times, however, as they played with little passion in the first few games. It's good to act like you've been there before, but they sometimes took it a little too far. I'm not a Gators fan. I'm not a Bucks fan (please, hold your fire until I've finished). But I rooted for the Bucks because I can't stand Joakim Noah. I like a team with swagger, not a team with arrogance. Noah is arrogant. You can see it in his face, his eyes, when he makes a crucial basket. I couldn't stand to watch Al Horford do his little "dance" in front of the camera when he scored on the fast-break late in the game. Unless it's the Reds or Bengals, or a team I genuinely hate is the opponent, I will never root for a team to repeat as champions. I don't have it in me pull for the Goliath. That said, however, the Gators earned this win, beating the Bucks in nearly every facet of the game. They ran the most pristine, textbook pick-and-rolls, and the Baby Bucks were just too exhausted to rotate over in time to cover the open man. Oden is showing me game after game that he's just not ready for the NBA yet. He'll probably go early in the first round of the draft, but he doesn't deserve it. He certainly has tremendous upside. He has a beautiful hook. He's a beast under the basket. Trying to shoot over his extended arms is like trying to pole vault over the Empire State Building. But too often, his head isn't in the game. He refuses to kick the ball out for the three, even when he's covered by three men. He'll usually find a way to jam the ball in, but there are too many times that he resorts to the hook when all he has to do is pass it out to Conley or Butler. He tries to do everything himself, even when he's been out on the floor for 18 consecutive minutes. He's surrounded by some of the best young guards in the nation, and he continues to keep the wave of hype alive by trying to do too much. Defensively, despite his tremendous ability to block shots and grab the contested rebound (when he isn't completely exhausted), he refuses to rotate over when the other team executes a pick. And for this reason, the Gators knocked down three after three, only going one-on-one with Oden when he was exhausted. The OSU guards, who have relied on the three-pointer all season for nearly 1/3 of their points (despite Oden's consistent and highly-praised production), couldn't find the basket from the perimeter, going 4-for-23. At times, I felt clueless as to why Coach Matta didn't change up the gameplan a little more, given the fact that the Gators are number-two in the nation when it comes to defending the three. Perhaps utilize the speed of the guards to drive and kick out (something that Conley does to perfection). The three has always been a strength of the Bucks, but once the Gators took that away, they tried to rely on Oden to make up for the lost production, and once he got tired, it was all over. This is to take nothing away from the Gators. They have the most complete team in all of college basketball. Green, Humphrey, and Brewer are beasts from nearly anywhere on the court, and give them more than a foot of space, they'll knock down a three. As I said before, Florida executed some of the most beautiful pick-and-rolls I've ever seen, and despite the Bucks' hunger for revenge (for the BCS Championship, for the 30-point loss in Gainesville earlier this season), fatigue just proved to be too much for them. Florida had them running all over the court, and they never took a bad shot. Simple equation for winning basketball. Florida was the better team tonight. They were the more experienced team, the more energetic team, and the only championship-caliber team on the floor. Now, bring on the firing squad.